Olivia de Havilland, 94, looked radiant today as French President Nicolas Sarkozy pinned her with the Legion of Honor insignia at the presidential palace. 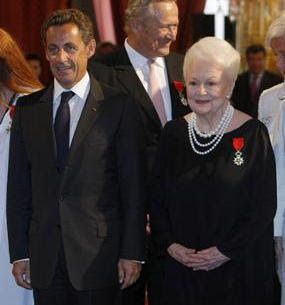 Sarkozy told de Havilland, "You honor France for having chosen us." The American actress of British origin has lived in Paris since 1953, according to AP. De Havilland played the role of fragile southern belle Melanie Wilkes in Gone With The Wind and is the last surviving major star of the 1939 classic.